The mission of the Biochemistry and Biotechnology Program is to provide students with a solid foundation in both chemistry and biology, as well as specialized training in the rapidly growing fields of biochemistry and biotechnology. Majors have the opportunity through coursework, laboratories, seminars, and research experience to develop the knowledge and skills necessary to enter the workforce or to go on with further graduate education. B.S. degree: High school graduates who meet UMSL admission standards. M.S. degree: University graduates with a bachelor's degree in biology, chemistry, or biochemistry (or a related field) and course work in genetics, organic chemistry, and biochemistry. Applicants must also have a minimum GPA of 3.0 (on a 4.0 scale) overall. The strength of our interdisciplinary curriculum is reflected in student scores on major field assessment exams, where our graduates rank very high compared to national norms. A large fraction of our students are engaged in research projects as part of their elective credit hours. 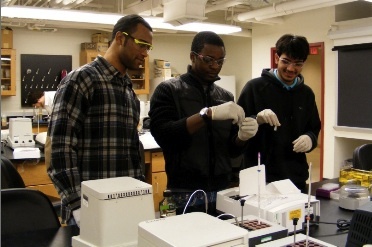 Students work on individual projects in research labs of BCBT faculty members. Many graduates are employed in industry or academic laboratories. Graduates have also gone on to pursue further training in Ph.D. programs or professional schools of optometry, dentistry, medicine, or vetrinary medicine.